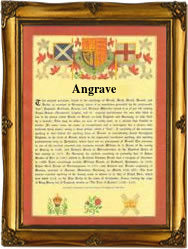 Recorded in the spellings of Angrave and Angrove, this is an English surname. It is locational from some place whose origins were probably the Olde English pre 7th century words "angr" meaning grazing land, and "graf" a small wood or thicket, to translate as the thicket in the field. However none of the gazetters of the past two hundred years or so seem to record such a place, and therefore we have to assume that this is one of the estimated three thousand or more British Isles surnames which originate from places now classed as "lost" villages. In the period around the 14th century there were several plagues which decimated the population. At the sametime the growing demands of the beginings of the textile industry encouraged land owners to change from arable to pastoral farming, particularly sheep, which required far fewer workers. When this occured the tenants who had survived the plagues, were in effect driven off the land, and forced to seek homes and employment usually in the towns. For identification they took, or were given, as surnames, the name of their former home. In this case we have some early surviving church recordings from various parishes which include: John Angrave, who married Joan Atkinson at St Margarets, Westminster, on June 14th 1584, and Grace Angrove who married Thomas Oddy at Guiseley in West Yorkshire, on May 9th 1614. Another recording from the same period is that of Johannes Angrave, the son of Johannis Angrave, christened at St Martins in the Field, Westminster, on July 14th 1669.